A trust fund has been set up for Jonah Lomu's children after it was revealed the New Zealand rugby union great had almost no savings when he died. 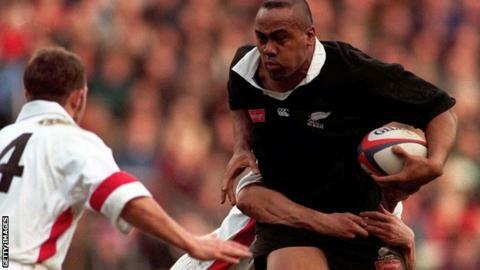 Lomu died at the age of 40 in November having been diagnosed with a rare and serious kidney condition in 1995. The chief executive of the New Zealand Rugby Players' Association said Lomu's generosity had left him with virtually no money at the time of his death. "Jonah's family have not asked for this assistance," said Rob Nichol. Lomu scored 37 tries in 63 matches for New Zealand between 1994 and 2002. His health problems forced him to quit the game and he had a kidney transplant in 2004, but the organ stopped functioning in 2011. Nichol added: "He was a humble and private person who chose not to seek help or be a burden on others in sharing his immediate challenges. "Despite his debilitating illness, he was unwaveringly optimistic and clearly had faith he would be able to continue working to meet these obligations and to provide for his family. "Due to his untimely death, we all know this is sadly not to be and Jonah is now unable to provide for his boys - for their development, welfare and education."